FYI: The photo is Goody Hallet being released after tagging (2008) Cape Cod, MA. Everyone's tucked in safely down in South America. I'm off to Israel in February for a brainstorming session with the European Osprey trackers to think about how we can improve our educational outreach efforts. Should be an exciting trip. Well, our Ospreys aren't doing much of anything right now--which is just how we like it!--but things are pretty busy in Ospreyland up on our side of the equator. I'm heading over to Israel tomorrow afternoon for a 4-day workshop and brainstorming session with the European Osprey mafia on how we can best use our satellite tagged Ospreys for educational outreach. This has always been something I've felt to be a very important part of the whole tracking project. For the most part, we've been frustrated in our efforts to reach out to teachers because they now, thanks to No Child Left Behind, have to "teach to the test" and don't have time to make use of all the interesting data coming back from birds nesting in their back yards. I sorta-kinda remember getting an email from someone in our "flock" about using the website with their classes. So, have any of you used the website for educational purposes? If so, I'd love to hear about it (before Wednesday!). It's gearing up to be a busy spring. I've been contacted by the Earth Conservation Corps in D.C. They have received a grant to tag a couple of Ospreys on the Anacostia River as a way to connect urban schools to the nature around them. Then, the manufacturer of our telemetry transmitters has asked me to tag 4 adult males on the Chesapeake as part of an environmental education program being developed by the Chesapeake Bay Foundation. In return for my help on that project, they've agreed to provide 2 of the new cell-tower transmitters for adult males on Martha's Vineyard. We're targeting two birds that nest on properties owned and managed by the Trustees of Reservations. We will be installing motion-activated video cameras on feeding platforms near these nests, so we'll have a fairly complete record of what fish are being delivered to the nests and we'll be able to match the times of arrivals with the GPS data to see exactly where the birds are hunting and what species of fish they're bringing home. This should be really exciting. Later in the summer, we'll tag a juvenile at each of these nests and follow their migrations. For those of you who generously pledged to help support the purchase of a transmitter, this will be where we'll spend those funds. We will have a system in place very shortly for you to send your contributions so you'll get the tax benefits of the contribution. For those who haven't pledged, we're about 3/4 of the way to fully funding a transmitter. It would be great if we could fully fund one of the two transmitters. We'll also be tagging new birds on Fishers Island, working with the Henry L. Ferguson Museum, and in Essex County on Massachusetts' north shore, working with Essex County Greenbelt Association. Plus some new birds in New Hampshire and one on Long Island. This is another winter report where I’m happy to say that our Ospreys are doing nothing but getting fat catching fish down in Colombia, Venezuela, Bolivia (? ), and Brazil. North Fork Bob and Sr. Bones usually head north around the 20th of March, so we’re a month off from their departures. Bridgewater Art, our New Hampshire male, is on his first migration, so we don’t know when he’ll start north. He has a long way to go, so I won’t be surprised to see him head north before Bones or Bob. Belle will start her second migration north probably fairly late—she doesn’t have a nest to get back to yet. Maybe she’ll surprise us and get up early enough to start housekeeping. Will she go back to Deep Bottom Cove where she spent so much time last summer, or head over to the Cape, where she spent the last month or so before heading south for her second migration? This is the really fun part of tracking juveniles. Snowy, our almost 2-yr old, will be on his first trip north. He’s pretty much a teenager, and we all know they don’t get up before noon, so I don’t expect him to move before some time in April or even as late as May. Then there’s Bridger and Rammie—our 2 Westport River, MA, adults with cell-tower-based transmitters. We have no idea where Rammie is, but we know Bridger got as far south as Bolivia. It will be fascinating to get their data, if they make it back. So while our birds weren’t moving, I was. My New Hampshire colleague in the Osprey tagging game, Iain MacLeod, and I were invited to attend a workshop in Israel where, along with Osprey trackers from all over Europe, we brainstormed on how we can best take advantage of our tagged birds for educational outreach. Who’d have thought that our research would wind up in the Jerusalem Post? Ospreys have nested at Rutland Water, an internationally important site for wetland birds situated in central England, since 2001 following a successful re-introduction project. In 2011, two adult Ospreys were fitted with GPS transmitters. The birds’ migration data was posted on the Rutland Osprey Project website ( ) and was avidly followed by thousands of people around the world, including many schools. The data proved especially valuable in geography lessons where it was used to teach students about a diverse range of topics, including latitude and longitude, international development and different habitats and landscapes along the migratory flyway. The migration of the two Rutland Ospreys, and the interest it generated, demonstrated the unique ability of migratory birds to link people around the world. To develop this concept further, the Rutland Osprey Project has initiated a pilot project, linking schools in the UK and The Gambia in West Africa. Students, aged between 8 years and 15 years, have exchanged letters and videos helping them to develop their knowledge of Osprey and bird migration, and to learn about another country and culture in a new and exciting way. As part of the pilot scheme, the project has developed a programme of fieldtrips for three Gambian schools, led by a local bird guide. This has given the students an opportunity to observe Ospreys and other wildlife in their local area. Much of the initial work has been undertaken during trips by the Rutland Osprey Project team to West Africa but for the project to be sustainable in the long-term, computer and internet infrastructure is required in the African schools. This would allow students at those schools to follow satellite-tagged Ospreys online and to communicate with schools, via e-mail and Skype, in the UK and elsewhere on the flyways. In addition to direct links between schools in the UK and The Gambia, there is potential to link schools and students from many other countries along the migration flyways between Europe and Africa and North and South America. With this in mind, the Rutland Osprey Project has set-up a trial website to demonstrate how schools could be connected. The website provides background information on each school and contact details of a teacher. So, do you know a teacher that's really gung-ho and might be interested in something like this? We think the prime ages for this are middle-school kids, but we’re equal opportunity educators—older students could design research projects and really play with the data. Let me know if you have any ideas on this! Spring, and our Ospreys, are coming! Exciting (and busy times) at Map Central! All 7 of our tagged Ospreys are now heading home. At least 3 birds are in the States. The uncertainty (it might be 4) is due to one of our cell-tower birds (Bridger), who rather miraculously found (for the 3rd time) a cell tower in the middle of NOWHERE--the rainforest along the Brazil-Colombia border. When he checked in from that most remote outpost, he dumped the missing data for where he spent the winter--which was way down south in Brazil--the farthest south any of our birds have gone. Since his last report home (15 March) we haven't heard from him again. A bit worrisome, because he should be in the states by now, so we should be getting some data. But we're so new at this (this is only the 19th cell-tower transmitter that our manufacturer, Microwave Telemetry, produced) that we don't know to what extent no news is bad news. His neighbor on the Westport River (MA), Rammie, also chimed in and is leading the pack heading north--he's in Virginia now. He's a cell-tower finding fiend, so we're getting daily updates, and now have all his data from when we last heard from him (back in September!) heading south through Virginia. North Fork Bob and Sr. Bones, veterans on their 3rd satellite monitored trips north, were both in the Everglades on the 26th and 27th. They're both a week to 2 days ahead of last year's travel. Very surprisingly, our almost 2-yr old Snowy (Martha's Vineyard juvenile from 2011) started moving on the 23rd (I think). We've never had a juvie start this early. He even started before Belle, who started her 2nd trip north just a couple of days ago. Also early for a 2nd trip north. I very hastily threw a map together for the "Where's Waldo" map on the Migration 2013 page (http://www.bioweb.uncc.edu/bierregaard/migration13.htm) before dashing to the airport for an unexpected trip. I just read the narrative that accompanies the map--very sloppy, but you'll get the idea. When I get back next week, the birds will have moved a lot and I'll update all the individual maps. Our Ospreys are all making a big push to get back to the breeding grounds. I'm very excited to report that we now have an exceptionally cool map, thanks to the brilliant folks at Movebank (a huge data bank of animal movement data from all over the world), showing where all our satellite-tagged birds are. It's Google Earth format, so you can zoom in to see exactly where the birds were at any point along their migration routes. When you move one of the birds along its path all the other dots move to where they were then, so you can follow the race back to their nests. I'm not reporting here where they all are--you'll have to go to the map to check it out: http://www.bioweb.uncc.edu/bierregaard/migration13.htm. I'm way behind on generating the detailed and annotated maps for the individual birds. 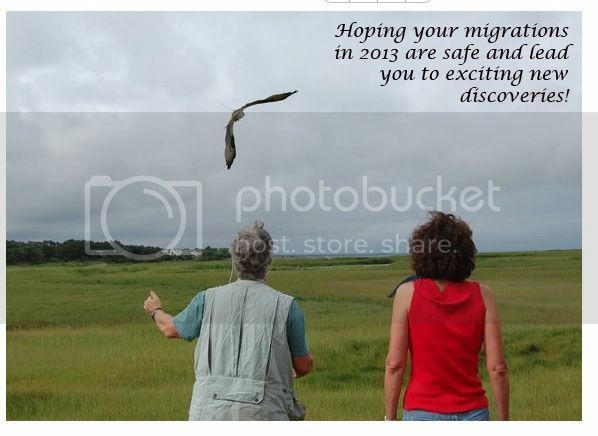 I'll keep working on them, but in the meantime, you can now check in on the Migration 2013 page whenever you want and know that it will be up to date. Our cell-tower birds aren't included yet (hope to get them linked in soon), so I'll have to fill you in. Bridger hasn't been heard from since March 15th, so I'm nervous about him. However, he does have a beta-version of new technology, so maybe there's a problem with the transmitter. I don't often hope for a transmitter malfunction, but I'm breaking with tradition here. As of yesterday, his mate wasn't home and no sign of him around his nest. We'll keep checking however and hopefully see him back soon. His neighbor, Rammie, probably arrived at his nest sometime today. He was in southeastern CT yesterday evening, only about 110 miles from home. That's just about 4-5 hours of migration time, so no big deal. When he went through the Philadelphia area he was 1.3 miles from my house. In fact, I thought I saw him out on the 3rd fairway of our local golf course yesterday. I did in fact see an Osprey there, and when I got home I was excited to see that his track was exactly where I saw the Osprey--but he had been there 4 hours earlier. His will be the next set of maps that I'll update on his map page.